Our new report on “Breadwinner Moms” has been the focus of widespread media coverage and much discussion about its finding that mothers are now the sole or primary income provider in a record 40% of households with children. 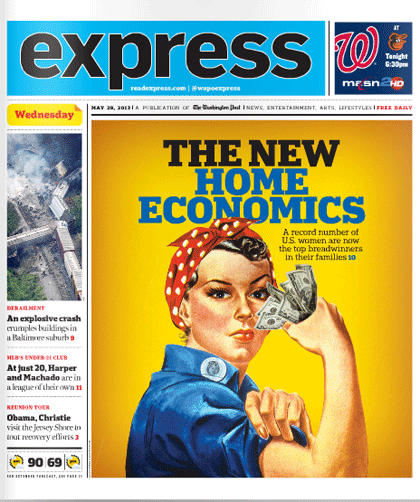 “Breadwinner Moms” could just have aptly been called, as it was by Washington, D.C.’s daily newspaper, the Express, “The New Home Economics,” with its adaptation of the iconic picture of Rosie the Riveter who symbolized the women who took jobs in U.S. munitions plants during World War II to replace the men who had gone off to war. Fewer Americans in the survey believe that it’s better for a marriage if the husband earns more than the wife. The public still differs about the right roles for mothers and fathers. The public is conflicted about more mothers working outside the home, weighing the benefits of the mother’s earnings against the challenge of raising children and maintaining a successful marriage. Use our comments section (below) to tell us your story: the experiences you’ve had, how they’ve compared to what we found in the study, what you think of the changes and what they mean for society.